This week in photos: Tomato fights and midnight harvests. 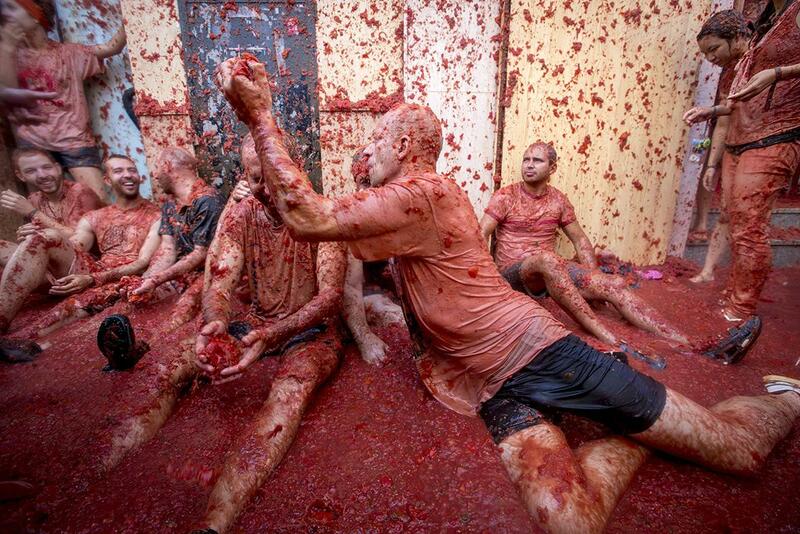 Revelers throw tomato pulp at each other during the annual tomatina festivities in the village of Bunol, near Valencia, Spain, on Aug. 26, 2015. Some 22,000 revelers hurled 150 tons of squashed tomatoes at each other, drenching the streets in red, in a gigantic Spanish food fight marking the 70th annual battle. 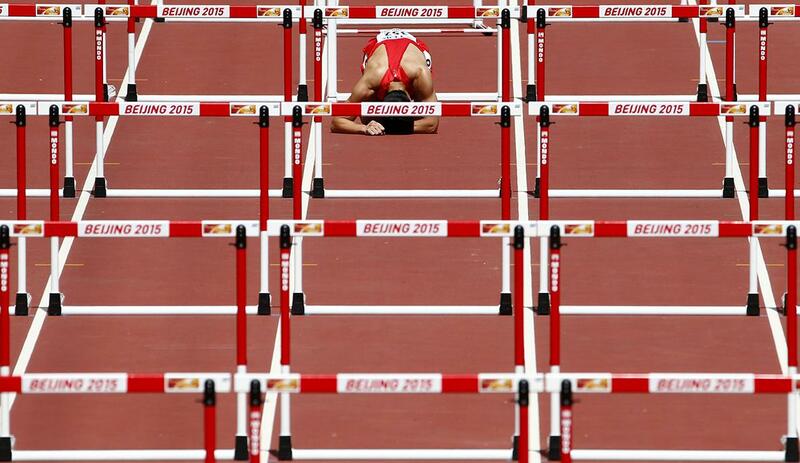 Zhang Honglin of China reacts after pulling up during the men’s 110-meter hurdles heats at the IAAF World Championships at the National Stadium in Beijing on Aug. 26, 2015. 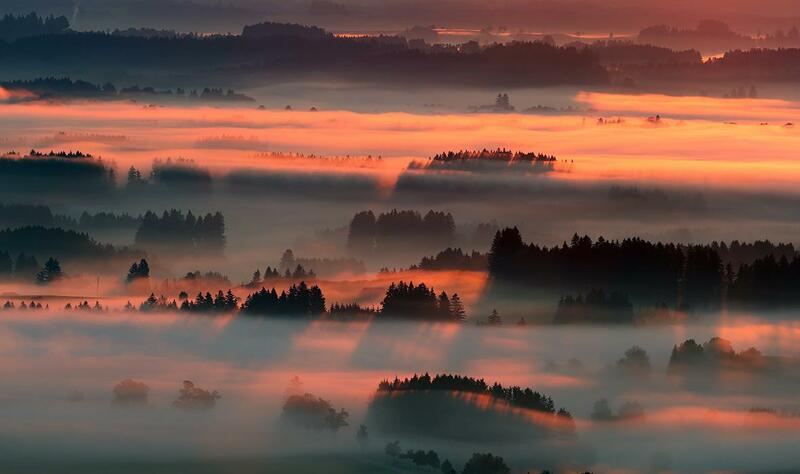 A rising sun illuminates the landscape on Aug. 22, 2015, near Bernbeuren, Germany. 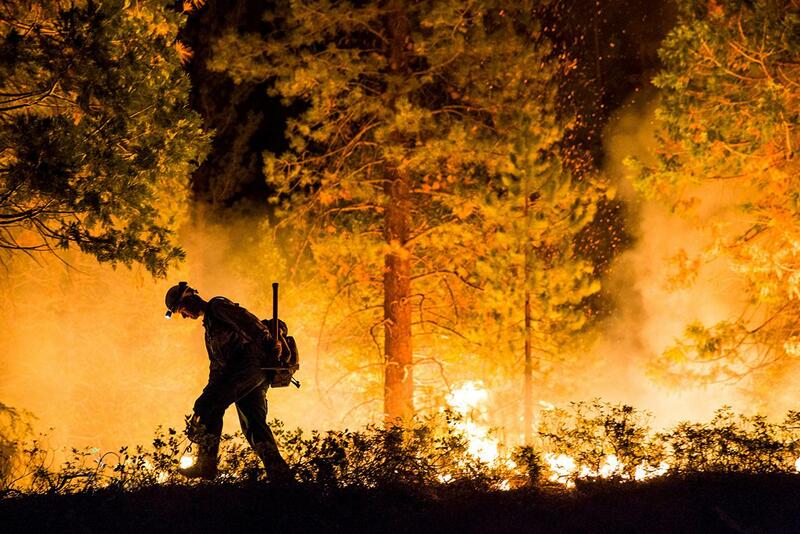 Fulton Hotshot Michael Turowski lights a controlled burn on the so-called Rough Fire in the Sequoia National Forest, California, on Aug. 21, 2015. In California, suffering its worst drought on record, about 2,500 people were forced to flee Christian camps east of Fresno at Hume Lake as the Rough Fire crossed Highway 180, officials said. 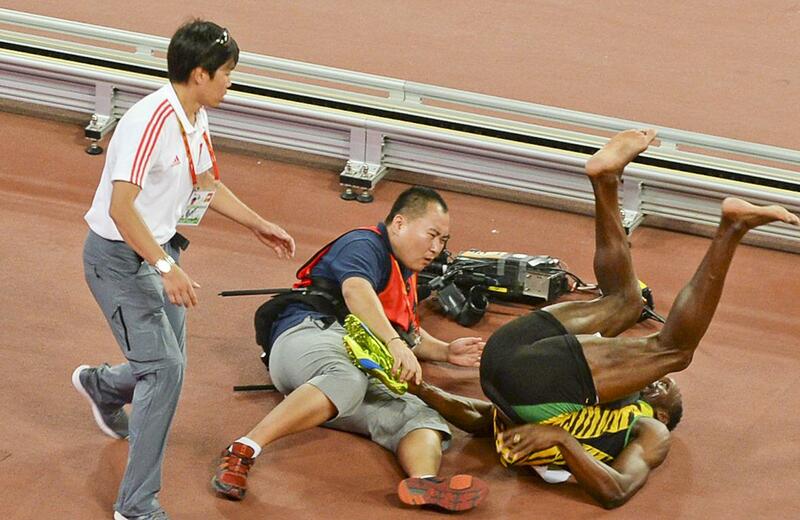 Usain Bolt of Jamaica falls after being hit by a cameraman on a Segway as he celebrates after winning the men’s 200 meters final during the 15th IAAF World Championships at the National Stadium in Beijing on Aug. 27, 2015. 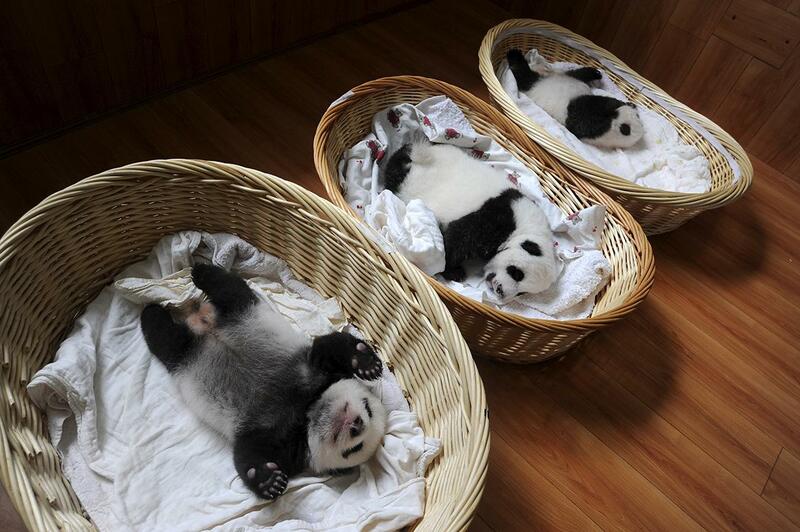 Giant panda cubs rest inside baskets during their debut appearance to visitors at a giant panda breeding centre in Ya’an, Sichuan province, China, on Aug. 21, 2015. Pickers work in the Moulin a Vent vineyard, near Chenas, Beaujolais, in eastern France, early on Aug. 26, 2015, during this year’s first Beaujolais harvest. Traditionally, grapes are harvested at the end of the night, when the temperatures are lower, to produce a “fruity and tender” wine. 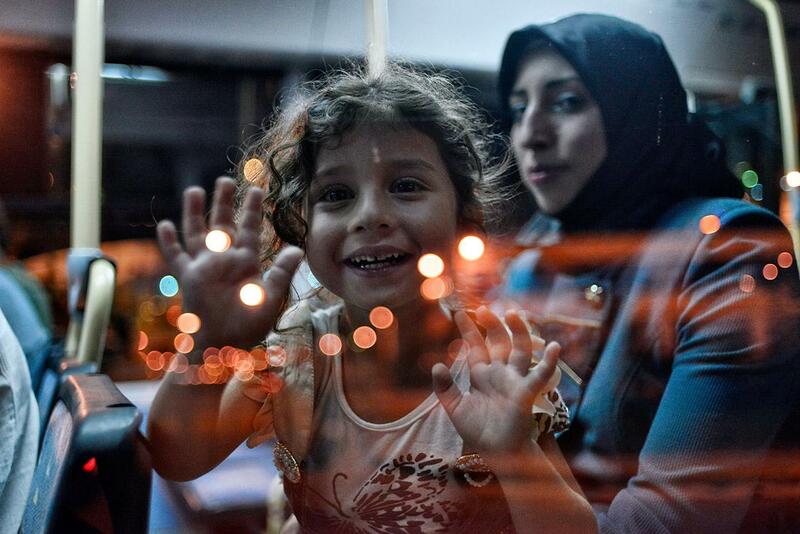 Syrian migrants travel on a bus after arriving on a ferry carrying about 2,500 migrants from the Greek islands in the main port of Piraeus on Aug. 26, 2015, in Athens. 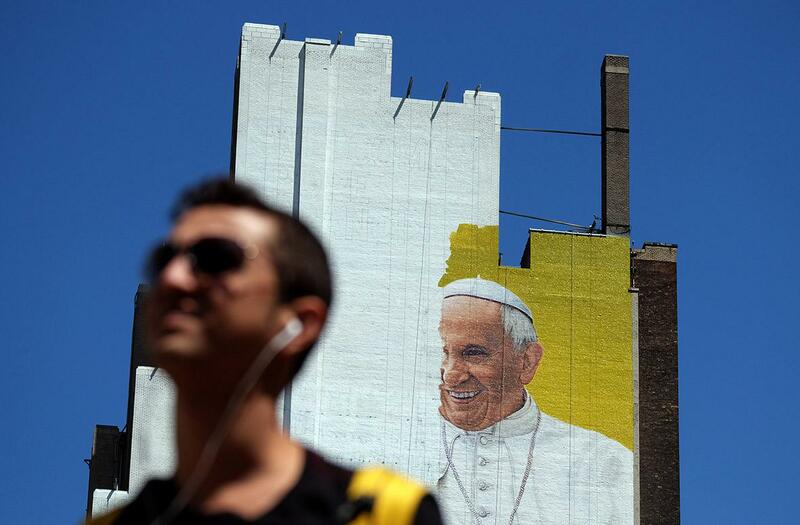 A man crosses a street as a partially completed mural of Pope Francis is seen on the wall of a high-rise building in New York on Aug. 28, 2015. Francis will visit the U.S. Sept. 22 to 27, stopping in Washington, D.C., New York, and Philadelphia. 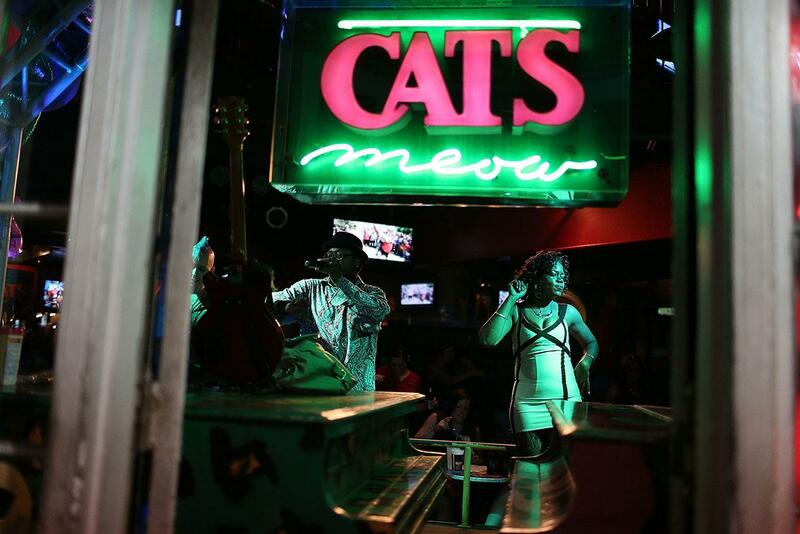 People dance in the Cats Meow bar in the French Quarter on Aug. 27, 2015, in New Orleans. Tourists have returned as the town prepares to honor the 10th anniversary of Hurricane Katrina, which killed at least 1,836 and is considered the costliest natural disaster in U.S. history, on Aug. 29. 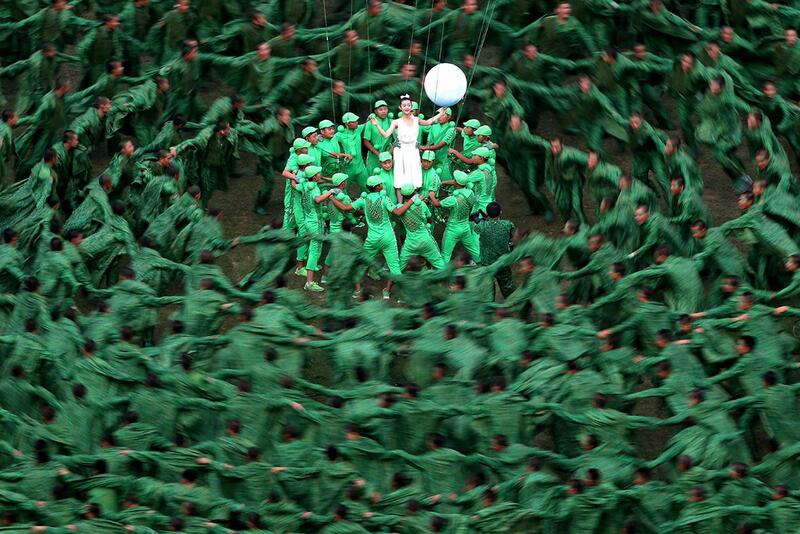 Performers dance during the Opening Ceremony for the 15th IAAF World Athletics Championships Beijing 2015 at Beijing National Stadium on Aug. 22, 2015. Sole Hope Executive Director Dru Collie speaks with children seated in a circle as they wear their new shoes soon after undergoing jigger removal and treatment in Kalebera village, Jinja district, eastern Uganda, on Aug. 6, 2015. The problem of jigger parasites, female sand fleas that burrow their way under skin, is widespread in the eastern, northern, and northeastern parts of Uganda. Left untreated, the parasite can lead to secondary infections that can be fatal. Encouraging people to cover their feet is part of the battle against the parasite; treatment includes a free pair of shoes, as very few of those affected are able to afford even sandals. Supporters of the hardline faction of the All Parties Hurriyat Confrence clash with Indian police during a protest following the house arrest of APHC leader Syed Ali Shah Geelani, in Srinagar on Aug. 23, 2015. Geelani was placed under house arrest shortly before attempting to leave his residence to address a seminar organized by the APHC. 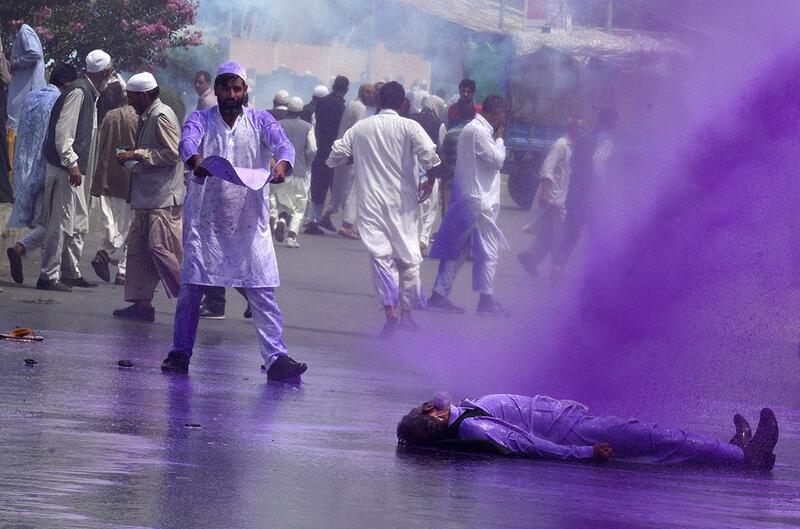 Police used tear gas shells and water cannons to disperse hundreds of supporters protesting Geelani’s arrest. 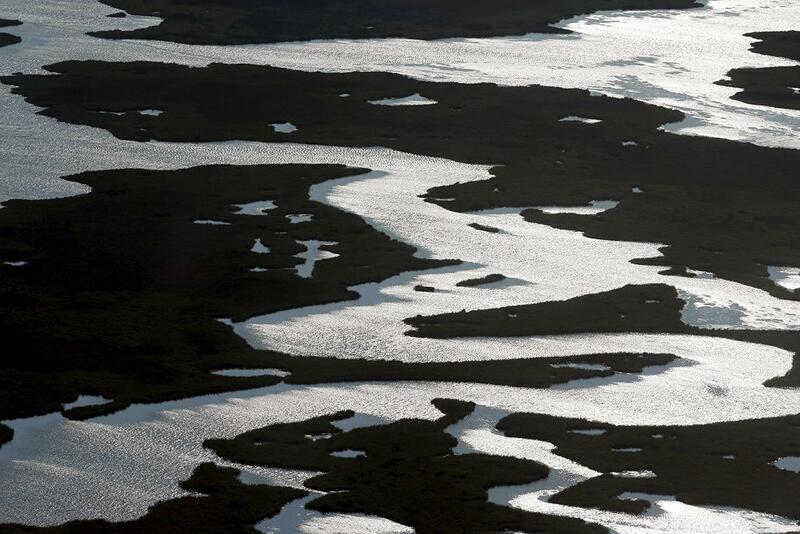 Depleted wetlands are seen on the edge of St. Bernard Parish, Louisiana, on Aug. 25, 2015.